A relatively new course which has it all; aesthetic appeal, good design, and feel. Typical Pat Ruddy examination that will have you on your knees if you don’t hit it well. An outstanding links, just choose your tees wisely. 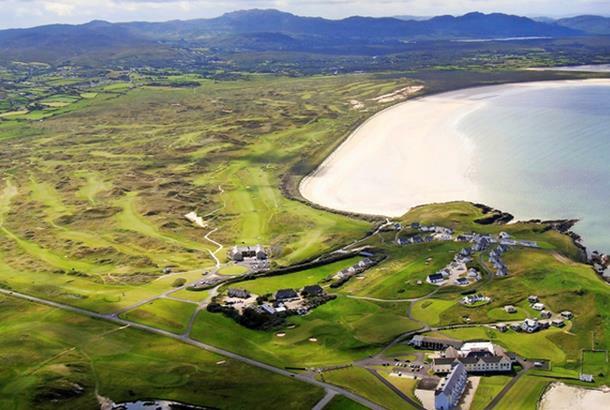 Rosapenna is Europe’s biggest links resort and this is the dramatic, star offering. Destined to become a classic, designed by links master Pat Ruddy, Sandy Hills Links is in many ways the ideal modern links. Each hole is spectacular and the views across the Old Tom Morris course to the ocean will salve all the wounds inflicted by this incredible golf course. Intended for the serious golfer, its narrow fairways appear constricting from the tee, but the landing areas sculpted from the dunes are deceptively wide. Above all, the appeal of this course lies in its beautifully balanced routing through the high dunes cloaked in marram grass. Many of the holes feature elevated tees and greens, with drives into natural bowls on the dune floor. Most of the holes run north and south along the dune ridges, parrallel to the front nine of the Old Tom Morris course. Not content with an Old Tom Morris links that was tweaked by Vardon and Braid. Rosapenna owner Frank Casey envisaged a second course in the giant dunes overlooking Sheephaven Bay. This course, opened in June 2003, is set to become one of the most famous golf courses in Ireland. Where Old Tom settled for a course alongside the dunes, Pat Ruddy has gone straight through them from start to finish and created an awesome course that will test any golfer.